Uroperitoneum (urine in the abdomen or ruptured bladder) is most commonly seen in young/newborn foals. It can be seen in the adult horse, but it is much less common and usually results when an intra-abdominal portion of the urinary tract ruptures secondary to a urolith (a stone within the urinary tract) –most commonly in males. Adult mares may experience a ruptured bladder following a dystocia (difficult foaling) but this is still not a common occurrence. For foals, however, there are numerous causes for uroperitoneum which include twisting of the umbilical cord (which results in vascular compromise to the bladder), trauma during foaling, systemic infection or sepsis, infected umbilical structures, as a result of the foal being down and needing to be manipulated frequently or congenital abnormalities. Fillies and colts are equally at risk for sustaining uroperitoneum. Foals with uroperitoneum often have no signs in the early stages –abdominal enlargement and straining to urinate are usually the earliest signs observed. Other signs include mild-to-moderate colic, generalized depression, inappetence/not nursing, scrotal enlargement in colts, straining to defecate (often mistaken for meconium impactions) and umbilical swelling. Foals with ruptured bladders will often continue to urinate normally. Clinical presentations can also include neurological deficits (caused by electrolyte imbalances – specifically low sodium), septic peritonitis or diarrhea (they often have a concurrent gastrointestinal infection). Ultrasound and abdominal fluid sampling and laboratory values (blood work reveals electrolyte imbalances, elevated kidney values and may show other abnormalities) are the most immediately useful diagnostics for the diagnosis of uroperitoneum. Radiography with contrast may also be useful if the region ruptured isn’t immediately evident. 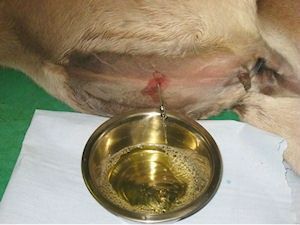 Treatment of uroperitoneum is typically medical and surgical; however stabilization of animals with a ruptured bladder is a medical emergency. Medical options include intravenous fluid therapy to correct electrolyte imbalances, urinary catheterization and abdominal drainage. Broad-spectrum antibiotic treatment is instituted to aid in infection control since most will have a concurrent infection. Surgical correction involves abdominal surgery to repair the bladder, if a rupture is the cause of the uroperitoneum. Although surgery is often required, it is important to have the foal stabilized medically (and electrolyte abnormalities corrected) before undergoing general anesthesia.